The UK is by no means the worst, but lags way behind the leaders. Indeed, if our government could achieve the same level of efficiency as the three leaders, we could now save roughly £140bn pa relative to the current level of UK government spending. Which would go a long way towards digging us out of Mr Brown's fiscal hole. 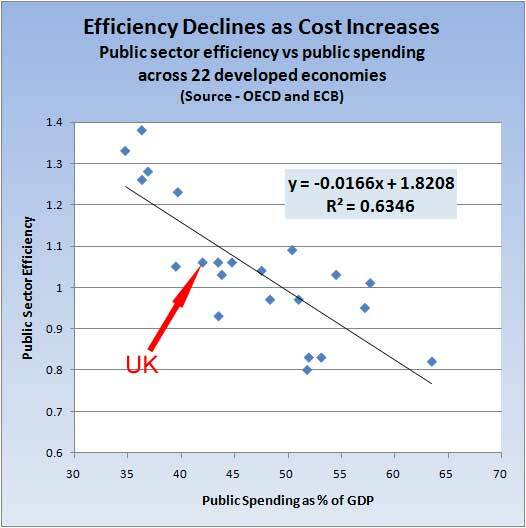 As we can see, efficiency tends to decline quite markedly as government gets bigger. On average, for every 10 percentage point increase in government's share of GDP, efficiency declines by 15-20% (the estimated parameter says 16.6%, but we can't be that precise, especially since this is a simple linear regression). 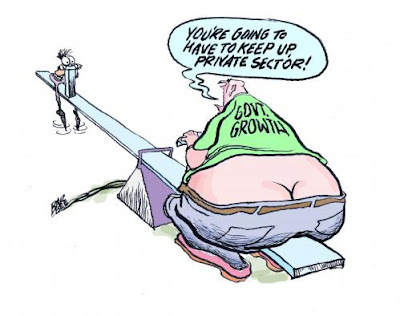 To put this another way, the only countries that can afford Big Government are rich countries that can bear the costs of its inefficiency - not to mention the costs of high taxation to fund it. The UK can certainly no longer afford that luxury.